George Coulouris led this first CCC ride of 2006 – in company with 9 other riders. 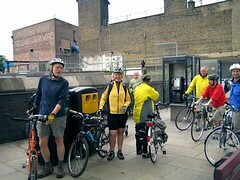 We met up under the canopy outside Kentish Town tube station and set off at noon on our ride through the city. 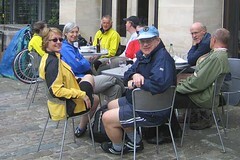 Our group of seven CCC members was joined by Fuzz and Charlie from Central London CTC and John from the New York. 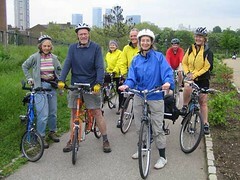 The idea of the ride was to explore a route from Camden to the Thames at Bankside, with a lunch stop at Southwark Cathedral and then through part of docklands to the Regent’s Canal at Limehouse Basin. The Canal towpath formed an easy return route interupted by a visit to Victoria Park and a nearby pub. We set off generally eastwards along Leighton Road, crossing Camden Road and into Corporation Street, then over North Road and down the west side of the former Caledonian Market and onto Market Road, across Caledonian Road into Mackenzie Road. Then we turned southward onto Roman Road, past the back of Pentonville Prison, over Offord Road and then via Belitha Villas onto Thornhill Road, where we joined the southbound LCN+ Route 7. This took us through Islington, across Pentonville Road and Rosebery Avenue, via the ‘behind cars’ cycle lanes in Lever Street, then down St Johns Street as far as Smithfield Market. Through the middle of the market, via the convenient cycle path to Little Britain, via the dark scary roundabout round the Museum of London, past St Pauls Cathedral with its current cartoon front over the scaffolding and down Carter Lane. Then we walked over the Millenium Bridge to the Tate Modern where we got on our bikes again to dodge pedestrians past the Globe Theatre, under Southwark Bridge, over the very cobbly bit past the Clink and the Golden Hind. We locked up our bikes on the well-placed racks outside Southwark Cathedral. Our lunch stop at 1 pm was at the Southwark Cathedral refectory, where we sat outside enjoying our lunch and getting to know one another. We set off again at 2 pm following the Sustrans 4 as far as City Hall where we turned to the riverside so as to be able to circumnavigate Ken’s Palace before climbing the steps onto Tower Bridge, where we crossed to the north side of the river and went back down the steps and under the bridge. The early afternoon was spent in the docks area, starting with St Catherine’s Dock and then via the ornamental canal past Tobacco Dock to Shadwell Basin. The area of the ornamental canal is surrounded by new housing and looks like a nice place to live – no evidence of motor vehicles. We rode along with the river on our right and Canary Wharf in front across the water. A short section of Narrow Street took us to Limehouse Dock, where we joined the Regents Canal towpath which we would follow most of the way back to Islington. But we turned off the towpath so as to be able to ride the ‘Green Bridge’ over Mile End Road, which forms part of the Sustrans Route 1 (running up the Lee Valley and further north). This is an ambitious project: a tall wide pedestrian and cycle bridge with grass and trees on it, linking parks on either side of Mile End Road with grassy slopes down on either side. It was built in the year 2000. The group congregated on the Green Bridge for the photo below. After stopping for a breather on the ‘Green Bridge ’ we took the canal to reach Victoria Park where we rode round to the ‘Victoria Park’ pub where we sat outside for a refreshing drink. The return to Kentish Town continued along the canal to emerge onto Packington Street, then a traversal of Islington and rejoining the outward route for the home stretch to Kentish Town.